The world of contemporary design is surprisingly responsive to contamination of different textures, colours and patterns. In recent years we have seen interior design projects in which accessories, fabrics and furnishings underline the creativity, boldness and expressiveness of many of their components, often with highly appealing, dramatic results. This desire to decorate the spaces where we spend our daily lives triggers an emotional response on several levels. It is a search for comfort that responds to the desire to surround yourself with your favourite colours and things, in an environment that is also enriched by contrasts and apparent flaws. All in your own personal film set, where the drama of your day-to-day life unfolds, along with your relationships and time with other people. Today’s surfaces are not immune to the charm of decoration, coming up with innovative proposals alongside the more traditional material effects of stone, marble, resin and cement. Coverings featuring decorative patterns also reflect a basic aspect of today’s interiors: attention to detail, a key element of the contemporary mood. 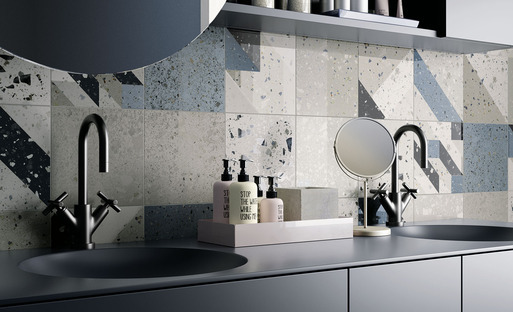 Imagination, creativity and a focus on detail are the sources of inspiration for the geometric patterns of Arqui and Bowl, the new surfaces Iris Ceramica presented at Cersaie 2018. 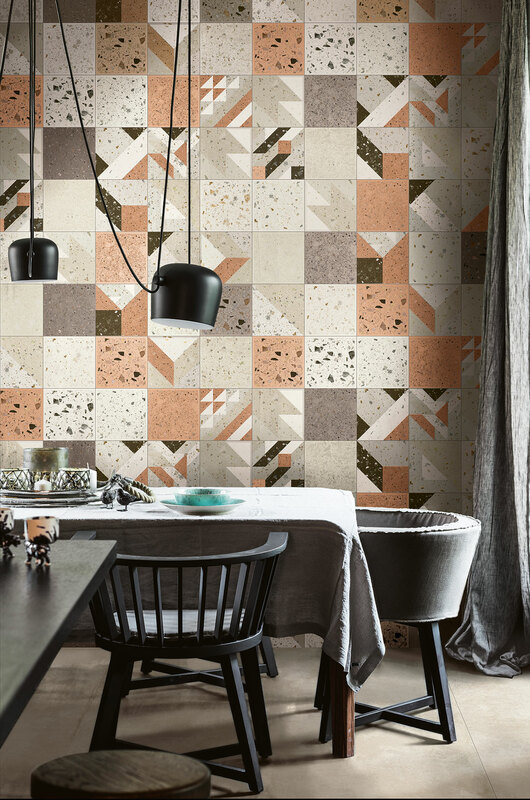 With more than 50 collections and over 2500 articles, IRIS Ceramica has been a world leader in the production of enamelled ceramic and porcelain floor and wall coverings since 1961. The company’s products are the recognised benchmark on the world ceramics market for residential, commercial and industrial projects. Despite non-stop technological evolution, IRIS’s corporate mission has remained the same for decades: improving quality of life with an exemplary selection of materials and a production process that pursues quality and technical innovation. Eclectic and elegant, Arqui is a new collection of IRIS coverings in the 20x20 cm size which "reinterprets the wealth of ornamentation of Venetian terrazzo flooring with a contemporary twist, combining the marble granules typical of traditional Italian floors with colourful superimposed geometric shapes, interwoven to make surfaces into precious tapestries." Arqui’s aesthetic research renews the style of porcelain semigres floors in a balanced combination of geometric shapes and colours. Arqui coverings for today’s spaces, full of warmth and intensity, are available in two versions, in Warm and Cold colour schemes. In the Warm version, the patterns in the composition are based on earthy hues of beige and brown, while the Cold colour scheme revolves around greys and blues. Bowl by Iris Ceramica is "a collection designed for vintage chic style coverings". Inspired by iconic details of the past, Bowl is a new interpretation of contemporary spaces produced in a handcrafted spirit in subtle natural hues. In a formal synthesis of the classic and the modern, the result is an original play of volumes with a diamond-cut effect of surprising dynamism and depth. The collection is available in the 10x20 cm size and in 10 pastel colours, in a colour palette ranging from pink and white to olive green, slate grey and mocha. The sensorial effect created by the Bowl surface is one of warmth and serenity; the range of natural colours permits use with a great variety of furnishings and accessories, giving free rein to your creativity and imagination.